Posted by Edwin Ritter in career, Miscellaneous, Social Media. So the other day, I saw a note from the fine folks at WordPress concerning my blog. 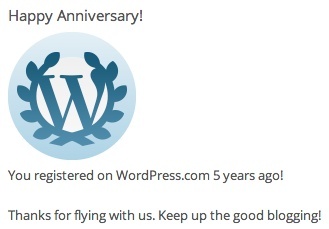 The note reminded me that I have been blogging now for five (5) years. Woot! A good run and I have no plans to stop. Well, to be accurate, it said I registered 5 years ago. No mention of how active I have been on the blog. A quick check of my blog archive shows I have had at least one post every month since I started with one exception. That distinction belongs to December 2010. That is the only month I did not post. So that makes 59 out of 60 months with a post. My style has evolved and is different now than when I started. Hopefully, it is improved and continues to get better. Writers always say the best thing to do is keep writing. I refer to this as Hemingway did as fighting the white bull. The archive shows there is a wide variety of blog topics – personal interests, professional concepts, business practices and social media changes. The all-time traffic leader by far is my ramblings on diversity (#1 above). More about that in a future post. I am in a much different place personally and professionally from when I started. I plan to continue on this journey and post further ruminations going forward. I hope you enjoy my observations and invite your comments. Which post is your favorite?